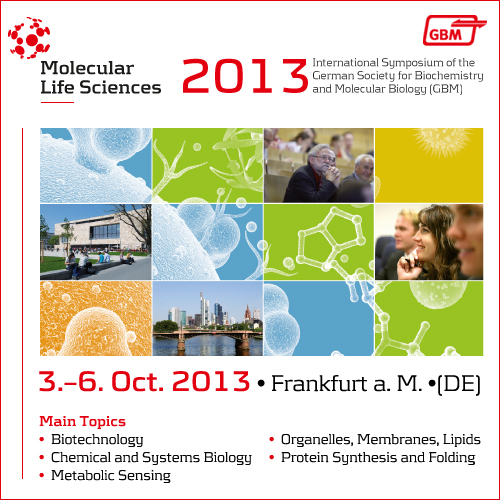 The GBM announces its upcoming biannual fall meeting 2013 in Frankfurt. We continue with our new tradition to have the meeting at the same venue in Frankfurt to strengthen our corporate identity and establish a prominent recognition factor. The meeting covers the major aspects of molecular life sciences from a broad range of model systems. Topics covered by distinguished plenary lectures include 'Protein Synthesis and Folding', 'Chemical and Systems Biology', 'Metabolic Sensing', 'Biotechnology' and 'Organelles, Membranes and Lipids'. The program was compiled in close cooperation with the GBM study groups, which select the newest and ground breaking contribution within their field as inspiring showcase to all participants. Young group leaders and investigators were especially encouraged and selected to present their newest ideas and most advanced approaches. Furthermore numerous young researchers will be selected from the submitted abstract and present their latest results in a Pecha Kucha format. Our industrial partners will showcase various scientific aspects in round table discussions and presentations. Our very active student’s organization, the Junior GBM, and the GBM workgroup of young scientists will focus on funding opportunities, career prospects and general perspectives for young scientists, as well as legal issues of scientific publishing and so on. On top of that, the poster sessions will offer insights into the latest research, providing also a great opportunity to meet colleagues, friends and coworkers.